The day-to-day life and struggles of a group of heroin addicts living in Scotland. "Trainspotting" is directed by Danny Boyle, who would go on to direct such Oscar nominated films as "127 Hours," "Steve Jobs," and the best picture winning "Slumdog Millionaire." It is written by John Hodge, based on the novel by Irvine Welsh. It stars Ewan McGregor as Renton, a Scottish heroin addict who hangs out with many other addicts and distasteful people. His primary friend group is comprised of Spud, played by Ewen Bremner, Sick Boy, played by Jonny Lee Miller, Tommy, played by Kevin McKidd, and Begbie, played by Robert Carlyle. Also in the film are Kelly MacDonald, Peter Mullan, James Cosmo, and Eileen Nicholas. A look into the life of drug addicts doesn't always provide the best time when watching movies, unless that drug is weed and goofy shenanigans ensue. When it comes to heroin and other opiates, one should naturally expect a dark and somber film, much like what we've seen in other projects like "Requiem for a Dream" or "The Panic in Needle Park." Director Danny Boyle manages to make a film about heroin addiction while displaying it honestly and somehow not making it completely morose. It does dip into morbid moments from time to time, one scene in particular is hard hitting and very unsettling, but these instances are few and far between. We watch as Renton and his pals scurry about Scotland looking for their next fix, all while doing depraved, trashy things in an often humorous manner. 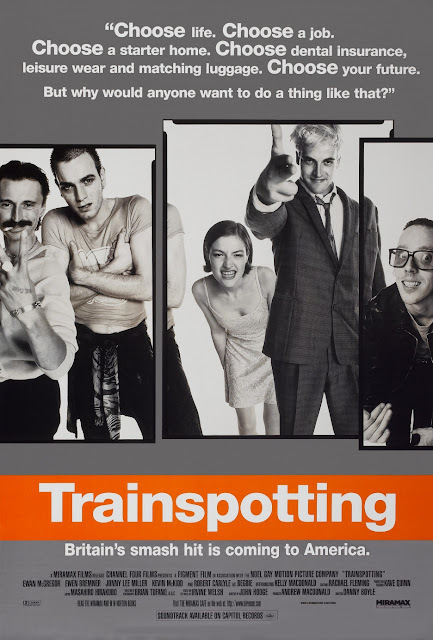 "Trainspotting" is visually striking with brilliant camera work, and we've now come to know this as a signature directorial style of Danny Boyle's. He plays with light and colors, twists the camera in odd ways, creating extraordinary shots, adding to the drug-induced madness our characters feel as they hit their highs and dip down to their lows. Ewan McGregor offers a brilliant performance as Renton as he narrates his story in a fast-paced, sometimes twitchy, sometimes composed cadence. The majority of the characters here are horrible people, but the actors still manage to make them charming, and in some odd way, endearing at times. Overall, this is an extremely engaging movie that keeps you enthralled with its characters and their stories despite how seedy and immoral they are. The film covers a wide range of emotions, including both comedy and tragedy, and does so in a way that never feels high and mighty or pretentious. This is an honest, effective film. If you have not seen it, check it out before the upcoming release of the long oft sequel, "T2 Trainspotting," in March/April 2017 here in the states.